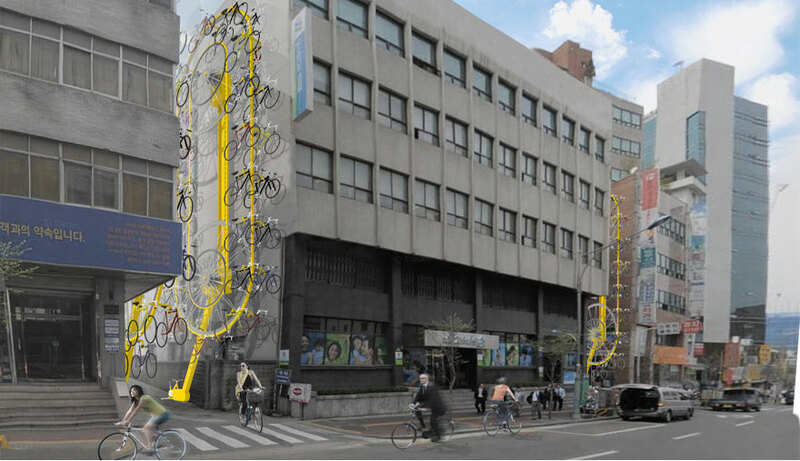 The vertical bike storage system, "Bike Hanger," increases urban space by changing the axis of bicycle parking. Photo via Manifesto Architecture. A stationary bicycle on ground level, called the “human generator,” powers the structure through pedaling. In order to retrieve a bicycle, the user must pedal to rotate the Bike Hanger until their bicycle is at the lowest point of the device. The user can then pull the retractable hanger and retrieve their bicycle. 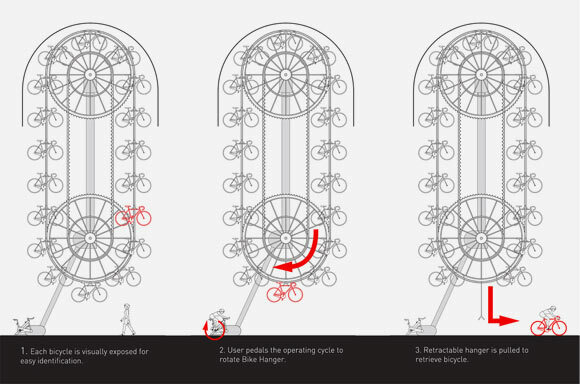 Similarly, in order to place a bicycle on the vertical rack, the user must pedal until an empty retractable hanger is at a reachable point and lock their bicycle into the system, eliminating the need to carry bicycle locks and chains. The structure’s own locking system can also serve as a relief to bicycle owners who choose to carry their bicycle seats and front tires as an extra measure of safety. Manifesto Architecture intends to build the structure out of all recycled materials, including recycled plastic bottles, stainless steel, and carbon frames, in order to make it an all-around sustainable city addition. Besides the structure’s functional purpose for its users, the colorful and iconic nodes that make the device so unique create a landmark for all urban-dwellers, helping them navigate the city. Further enticing is the project’s annual maintenance cost of $15 for lubrication and calibration of the human powered pedaling storage system, arch daily reports. 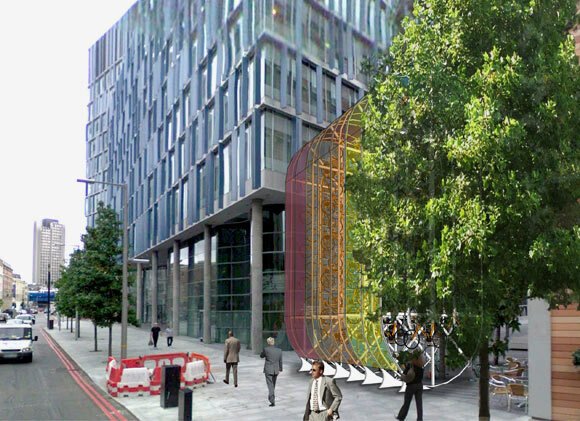 The concept of “Bike Hanger” is currently being developed for Seoul and London, though the project’s low maintenance cost, dedication to using recycled materials and ability to save sidewalk space make it an alluring investment for any city.